• WalllPeg pegboard is superior to all other types of pegboard...can be used indoors or outdoors... rain or snow it will never rust away like metal pegboard. • Pegboard is spaced from wall with molded ribs for added strength with attractive finished sides...no spacers or furring needed like other pegboard. • WallPeg's reinforced flush mounting holes attach our pegboard to the wall, other brands use peg holes for mounting that can warp or damage board. • WallPeg pegboard installs in minutes and lasts a lifetime, only a screwdriver required for easy mounting. • Unlike metal peg hooks that easily fall out the pegboard, WallPeg's peg hooks lock with a simple push. • Peg hooks are made with recycled high impact, durable polypropylene to fit ¼" hole pegboard. 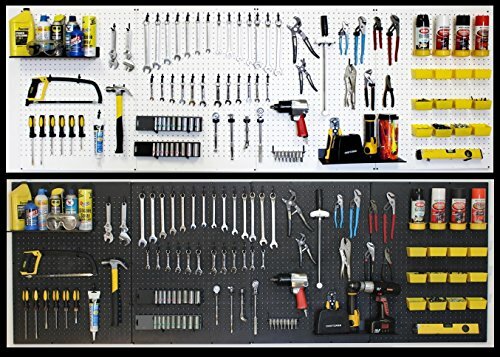 • Best Amazon Sales on Pegboard, hooks, bins, and shelves...search WallPeg .